This is the first of a series of columns that will appear from time to time, discussing procedures for using tools properly. Author Sheldon Brown begins with adjustable wrenches; he assures us that the tools discussed will become progressively more specialized in future columns. But don't turn up your nose; as Brown points out, there's more to an adjustable wrench than most people may realize. Brown, known to regular readers for his masterful April 1981 article on how to build wheels, used to be head mechanic for Bicycle Revival, a chain of 15 bicycle shops in the Boston area. For ten years, he has taught Fix Your Own Bike at the Boston Center for Adult Education. He is a founder of the Bicycle Repair Collective in Cambridge. Update as of 2010: Many bicycles now use quick-release and Allen-head fittings exclusively, but even if yours does, you may still need to carry a 6-inch adjustable wrench to help a friend in need. A 15- or 18-inch adjustable wrench remains a very useful tool for a home mechanic, as a universal headset wrench and to turn a freewheel remover, cassette lockring tool, do-it-yourself bottom-bracket cup tool or cartridge bearing mounting ring tool. The most basic bicycle tool is a small Crescent-type adjustable wrench. This is not a tool that gets much use in a well-equipped shop, but it is extremely versatile for on-the-road repairs. I recommend carrying one any time you cycle anywhere that you would not want to walk back from. You can fix more things on the average bicycle with this one tool than with any other. These wrenches are available in 4, 6, 8, 10, 12, 15,18, and 24-inch sizes. The 4-inch size makes sense only for some of the newer, fancier bicycles that have quick-release wheels and use Allen bolts for the saddle and handlebar adjustments. This is because the 4-inch wrench only opens up to a bit over 13 millimeters, so it will not fit axle nuts of non-quick-release hubs, which are usually 14 or 15 millimeters. Even if it did fit, a 4-inch wrench doesn't have a long enough handle to let a person of normal strength get the needed leverage to tighten axle nuts properly. The same is true of handlebar and saddle adjustments. If your bicycle has quick-release wheels and uses Allen bolts for the handlebar and saddle adjustments, a 4-inch wrench will be very useful for working on your brakes and derailleurs, also for securing accessories such as carriers, bottle cages, and lights. The most practical size wrench for carrying on a bicycle is the 6-inch. Depending on the brand, a 6-inch adjustable wrench will open up to 19 millimeters or more. This is wide enough to fit anything on a bicycle except the headset and bottom-bracket cups. The wrench has a long enough handle to give a person of average strength all the leverage needed for anything it will fit. A cyclist of less-than-average strength may need the extra leverage of an 8-inch adjustable wrench to tighten axle nuts and saddle-clamp nuts properly. The extra leverage is the only advantage to the 8-inch for bicycle use, because even though the 8-inch will open up wider than the 6-inch, it is not enough -- any bicycle part that a 6-inch won't fit will also be too large for an 8-inch. In addition, the 8-inch wrench is too long to fit in a small tool kit, and is a good bit heavier than the 6-inch. Auto and motorcycle mechanics usually have a very low opinion of adjustable wrenches. They say that you should use a set of fixed-size wrenches instead. This is not always practical for bicycle work. When you travel under your own power, there is a limit to how many wrenches you want to carry around with you, and there is also the problem of lack of standardization. There are three major systems of wrench sizing: Metric, U.S. Standard (S.A.E. ), and Whitworth (British). To be ready for anything, you would need three complete sets of wrenches, as there is very limited interchangeability among these systems. The Whitworth system has been out of use since the 1970s, because of Britain's adoption of the Metric system, but there are still many older British-made bicycles on the road with Whitworth parts. U.S. Standard sizes are used on many parts of American-made accessories and older American-made bicycles, but American bikes almost always have foreign-made parts -- at least the brakes and derailleurs -- that require Metric wrenches. Bicycles made in Europe or the Orient will usually be all Metric, at least as far as wrench sizes are concerned. 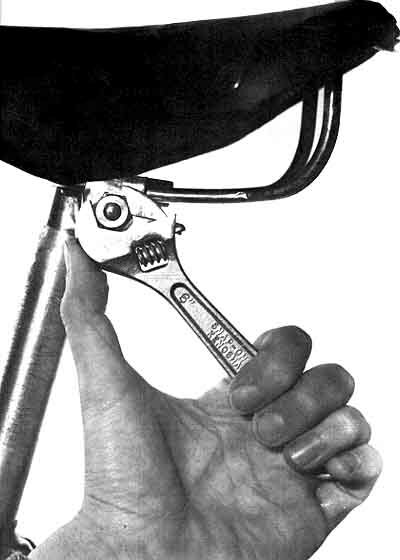 There is some disagreement over which is the better direction to use a Crescent-type wrench -- whether the moveable jaw should be on the "pushing" side or the "pulling" side; I have taken part in long debates on this subject, and I know excellent mechanics on both sides of the question. In practice, however, it makes no real difference if you are using a wrench of good quality. Which way to put the wrench on should be determined by the accessibility of the nut or bolt you are trying to turn. In tight spaces, such as adjusting a seatpost bolt on a bicycle with a low saddle and a rear carrier, it may be necessary to keep flopping the wrench over, turning the nut 1/12 turn with each fetch. Adjustable wrenches used carelessly can cause damage to nuts and bolts and injury to your hands, so it's very important to use them properly. Try to place yourself so that you can turn the wrench by pulling on it, rather than pushing. If you push on a wrench and it slips off of the nut, you are very likely to wind up punching something hard with your fist. This is why adjustable. wrenches are sometimes called "knuckle-busters." The other common mistake people make with adjustable wrenches is to be careless in adjusting them. Every time you put the wrench on a nut, turn the adjusting screw with your thumb while lightly rocking the wrench back and forth, to make sure that the wrench is adjusted for as tight a fit as possible on the nut. This is necessary because each time you take the wrench off the nut and put it back on, it loosens up a little bit. If you don't re-tighten the screw, the wrench will loosen up and slip off the nut when you try to turn it. This may damage your hand, and will certainly damage the nut, by rounding off its corners; then no wrench will fit the nut properly. You can buy a 6-inch Crescent-type wrench for as little as a couple of dollars, or your can spend up to $8 for one that, at first glance, looks identical. In this case, however, the "bargain" is no bargain. To be reliable, a wrench must be made from the finest chrome-vanadium steel. One way to judge the quality of a wrench is by weight-- the cheap ones are heavier because they are thicker. This is an attempt to make up in quantity of metal what they lack in quality. If you buy a cheap wrench, it may work all right for a while, but with time and use, the jaws will bend so that they are no longer parallel. Once this happens, the wrench will never fit anything properly -- you will have to throw it away and buy another. If you buy a good-quality wrench, it should last indefinitely. The better brands come with a lifetime guarantee. In particular, the Craftsman line from Sears Roebuck and the Blue Point from Snap-on have a lifetime guarantee that is good anywhere in the United States. If you have a broken Craftsman hand tool, you can take it to any Sears store for a free, no-hassle replacement. The same is true of Snap-on, except that Snap-on has no regular retail stores. Snap-on tools are sold out of big white vans that are rolling tool shops. These vans have regular routes, primarily selling to garages. If you are riding by and see one of these trucks parked, stop and talk to the driver, who will be glad to give you a catalog and sell you any tools you want. Snap-on tools are very expensive, but they are also the very best. The Snap-on Blue Point 6-inch adjustable wrench is the lightest I know of, weighing 100 grams, compared with 125 grams for the average good-quality unit. It also opens wider than most.